Click on image for large size. Notice the glow from the rootless shield area on the upper left seems greatly subdued from the previous two days; perhaps that area is crusting over and being drained to the lower pali flows. 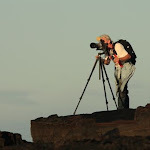 The photos above and below were taken last night around 9:00 PM from the Kalapana Gardens access road with a 400mm lens. They both show how much further surface lava has advanced down the Pulama Pali in the last 24-hours. I would guesstimate the leading edge to be as low as the 1000-foot elevation, or possibly lower because some of this flow appears hidden behind a rock ridge and tree-tops are backlit by lava glow. These new flows look nearly identical the shield breakouts and subsequent pali flow we witnessed in late June of this year, which was essentially the beginning of our massive July Quarry flow. 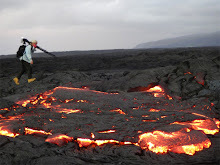 The coastal flats and ocean areas are inactive as far as lava flowing at this time. Lava began receding in those areas about November 29th & 30th, or one week ago. 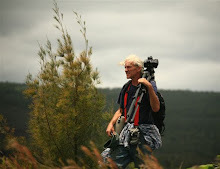 I will post updates as warranted depending on new activity. 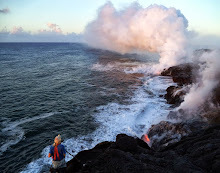 The Hawaii County lava viewing area remains open daily from 2:00 PM until around 9:30 PM. Located off the end of Highway 130 one mile further on the one-lane road. During the day visitors can walk the viewing road and see the still very hot, shiny and extensive lava fields, the burned out roofs of two homes sadly destroyed recently. 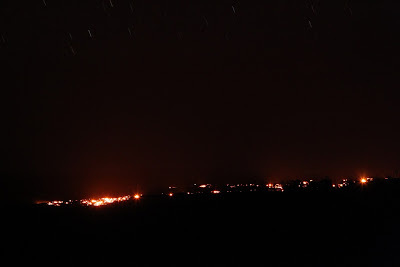 By night, weather & eruption depending, we are seeing molten lava moving down the Pulama Pali at a distance of about two and a half-miles away. Also, the reflective lava higher up at the rootless shield zone at about the 2000-foot elevation. Phone Janguard onsite security from 2:00 PM until 10:00 PM for further information: 430-1966 OR 217-2215. Meanwhile, up in Hawaii Volcanoes National Park, the Halema’uma’u crater continues erupting 450-feet down inside the craters floor pit vent: sulphur dioxide plume stream by day, which often glows dramatically red after dark. The park is open 24-hours a day seven days per week.